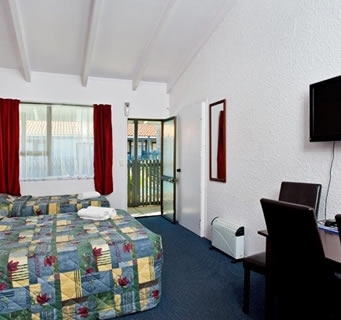 Look no further than the Cortez Motel for affordable accommodation in sunny Whakatane, located in the beautiful Eastern Bay of Plenty. Rooms have a queen-size bed, single bed and armchair. 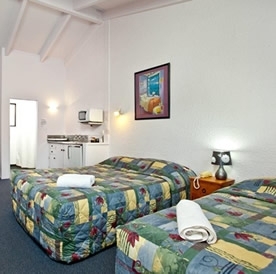 Rooms have a queen-size bed and a single bed. 2 self-contained units. These rooms have come with a queen-size bed, a single bed and a dining setting. They also have a kitchenette equipped with a two-burner stove top. Room 3 is suitable for wheelchair use. 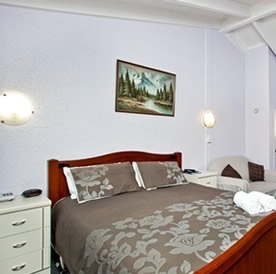 The room is furnished with a queen-size bed, single bed, armchair and spa bath. The room is furnished with a king-size bed, spa bath and comfortable sitting area. The room is furnished with a queen-size bed and single armchair. It also has a kitchenette equipped with a two-burner stove top. Walk-in bathroom is also suitable for wheelchair. This unit has a private car park entrance. The room is furnished with a queen-size bed and a bathroom with a spa bath. The room also has a kitchenette equipped with a two-burner stove top. This unit has a private car park entrance. 1-bedroom unit. Lounge has a queen-size bed, armchair and couch. Bedroom has 3 single beds. 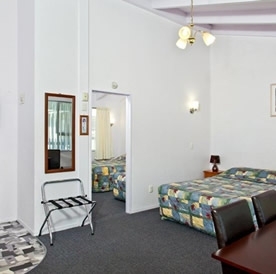 This room also has a dining table, plus kitchenette equipped with a two-burner stovetop. 1-bedroom unit. Lounge has a queen-size bed, single bed and couch. Bedroom has a queen-size bed and a single bed. The room also has a dining table, kitchenette equipped with a two-burner stove top. 1-bedroom unit. The lounge has a queen-size bed, dining table and comfortable sitting area. The bedroom has a double bed and a single bed. The room also has a kitchenette equipped with a two-burner stove top, plus a large bathroom with a spa bath.